UW-Madison Dairy Judging Team Places Second at 2015 National Championship! We are proud of our rich tradition in dairy cattle judging. Since Intercollegiate Dairy Cattle Judging started, Badger judges have won 11 team national championships. The UW-Madison Dairy Cattle Judging Team is coached by Chad Wethal and Brian Kelroy, now in their fifth year leading the program. The team normally consists of 15 – 20 students and each member is guaranteed a contest to compete in. In fact, most of our judges will participate in three or four contests over their collegiate judging career. Students earn academic credit for their involvement and are eligible to compete starting in their sophomore year in accordance with American Dairy Science Association guidelines. The dairy judging team competes in the fall, and we have sent teams to six different contests in the last two years. These competitions are hosted by Accelerated Genetics (WI), The All-American Dairy Show (PA), Eastern States Exposition (MA), The North American International Livestock Exposition (KY), The Fort Worth Stock Show (TX) and World Dairy Expo (WI). Our team members have varying backgrounds and experience in dairy cattle judging. Typically, freshman students interested in the team will take Dairy Science 205: Dairy Cattle Selection. This course covers linear type appraisal, score card appraisal, mating programs, breed comparisons and national genetic improvement programs to give prospective team members a foundation for future judging success. There are many benefits to be gained by getting involved in this activity. To start with, team members get to visit many of the best farms in southern and central Wisconsin. Another advantage is being a part of the fun and camaraderie of our team. And possibly most important, it is the life skills that this activity develops. According to employers who recruit at the UW, students who take part in dairy cattle judging become better decision-makers, better problem solvers and better communicators than students who do not participate. To be a part of the next page of the Wisconsin dairy judging legacy, e-mail Chad Wethal at cawethal@wisc.edu. 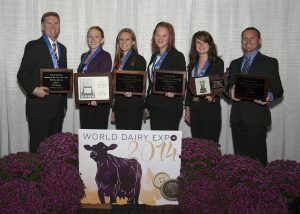 Join us on Facebook at facebook.com/UWMadisonDairyJudging.